Environmental Protection Agency chief and climate skeptic Scott Pruitt, who just months ago was widely rumored to be under consideration for a shift to the completely different role of attorney general, has seen his palace intrigue problems mount as more reports of wasteful behavior emerge. Though an EPA spokesperson characterized the matter to the Post as merely one of many routine solicitations considered by agency officials, this looks rather bad. President Donald Trump’s administration saw Health and Human Services chief Tom Price resign last year over similar allegations he handed taxpayers the bill for unduly ritzy flights. Pruitt is taking even more heat from separate accusations that he took a sweetheart rental deal from a fossil-fuel lobbyist, as well as reports of other expensive and slightly bizarre security measures. Whether all of this combined could put in motion Pruitt’s metaphorical defenestration from the federal government is unclear. 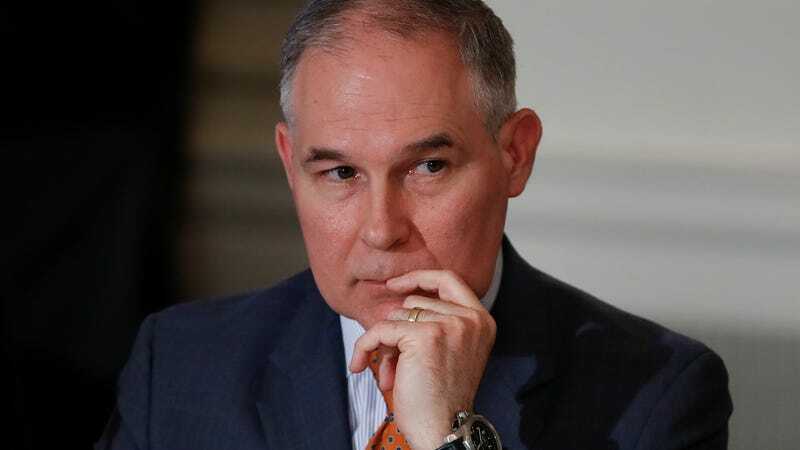 Reports have variously suggested that the White House is growing frustrated with Pruitt over the ongoing bad news, or that the president just doesn’t care because the EPA chief has been diligently carrying out the administration’s agenda. Pruitt clearly has a cozy relationship with lobbyists for industries usually associated with environmental disasters rather than environmental protection, consistently muddles the scientific evidence on climate change, and he’s happily set his sights on axing large numbers of the agency’s scientists and staff. The president believes cold weather proves the world’s climate science community is just a bunch of hoaxers, though, so these are likely all points in Pruitt’s corner.